A little more than a year ago my first book was published. In the years before it was released, I made a persistent effort to build my platform. For instance, nine or ten years ago, I started building a social media platform, first on Facebook, and then on Twitter, LinkedIn, Pinterest, Goodreads, and Instagram. For about six or seven years, I have been consistently blogging. I have been grateful to be featured as a guest blogger on many sites. Still, I did not fully understand the extent of marketing I would be doing once my book released. The not knowing was painful at times. Hopefully this post will give you some of the information I wish I had known ahead of time. Here are the five biggest marketing surprises, good and bad, I learned after my book released. 1. You won’t just market for a month or two, or three, or six. I didn’t realize I would be expected to market for years. In fact, I think as long as you have a book being sold, you don’t ever get to stop. 2. Most of the time you won’t have any idea how well your book is selling. I assumed publishers would send reports every month or every six months. That didn’t happen. At least not for me. I guess it’s difficult to determine the exact number of sales, partly because bookstores may order a few dozen copies but then send them back at a later date. I did receive a statement 12 or 13 months after my book released but it’s still not an accurate representation. By the time a statement is compiled and mailed out, more books likely sold. Without knowing how book sales are going, you have to market anyway. 3. You will market 101 ways and you won’t have any idea which marketing ideas will be most beneficial. You’ll do contests, hold signings, and have book launch parties. You’ll do giveaways and attend conferences. You’ll have write-ups in college alumni newsletters, you’ll give hundreds of books away to potential endorsers and media types. You’ll speak to groups, and give radio and TV interviews, all the while hoping for sales. *My pastor gave a sermon on Mother’s Day and mentioned my book. I sold about a 100 books. People rushed into the foyer after church to buy multiple copies for aunts, grandmas, sisters, girlfriends, and moms. *Ann Voskamp mentioned my book on her list of links one Saturday morning. My book sky-rocketed on Amazon. It was fun to watch the numbers for a day. 4. Your publisher is likely to give you books in order to help you market. When I signed my contract, my agent negotiated a certain number of free books I would receive in addition to my advance. However, I have been surprised with the generosity of my publisher. Several times I’ve headed to conferences and my publisher has given me books to give to the attendees. Also, Goodreads has a program where authors can participate in giveaways within the first six months of a book’s release. My publisher alloted quite a few books for these giveaways. 5. The things that make you the most happy won’t be the sales but the people you touch. It sounds cliche, but it’s true. I am humbled each time someone sends a thankful email or posts a review on sites like Amazon, Goodreads, or Barnes and Noble. This week I received a letter from someone who said my book encouraged her to go back to school to earn a graduate degree in Christian counseling. If you’ve marketed a book, what surprised you the most after it released? 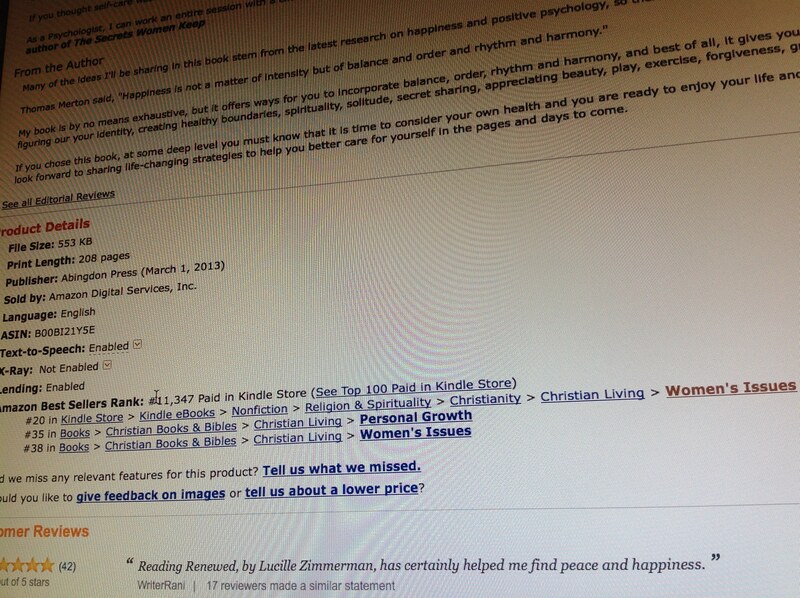 This entry was posted in Marketing and Promotion, Non-fiction, Publishing and tagged Ann Voskamp, book promotions, book sales, Lucille Zimmerman, marketing, Mother's Day, Renewed: Finding Your Inner Happy in an Overwhelmed World by Lucille Zimmerman. Bookmark the permalink. I agree with #5, big-time. A few months back I got an email from a reader who read my book about finding grace in the daily grind of parenting. She’d been having one of those days with her young kids where she was (as she put it) questioning her sanity and her fitness to be a parent. She started reading the book and read ten chapters in one sitting. Her email was so beautiful and honest and made me feel humble and grateful all at once. I printed it out and I read it every now and then when I need a little affirmation that this whole writing thing is worth it. Every author needs a “Fuzzy File” of nice emails from readers … they mean so much. Hi Ginny, what a great idea: a fuzzy file. Thanks for telling us how your book touched someone. Continued blessings on your writing. Lucille, how helpful to note all these. After marketing 9 books, my experiences are much the same. And yes indeed, we continue to “support” all our back books for as long as they are still alive—-which does mean years! But I’ve found that not burdensome. If we cared enough to devote our lives to its writing, God will give us the desire to continue to speak on that subject. What surprises me is how much I STILL feel joy and passion for each one of the books. Thanks for this post, which I hope will de-mystify the other side of the book for new writers! Leslie, thank you for taking the time to comment here. Nine books! I loved your book about forgiving our mothers and fathers, and you’re right, it shouldn’t be a burden to tell people about our babies! Yes, yes and yes! All great advice. Remembering to keep old books going takes effort but number 5 makes that all worth it. Great post, Lucille! I’ve found it helpful to specifically ask my pub house editor what my sales numbers are every few months to keep motivated. It does help with motivation doesn’t it Debra. Blessings on your sales. This is excellent, Lucille! I am in the first month of promoting my recently released book and am coming to understand some of the very valid points you make here – especially the part about never being done marketing your book! Michelle, congratulations on your book. I can’t wait to read it. It’s getting rave reviews. Hi Lucille. Loved this post as i released my first co-published book two months ago. 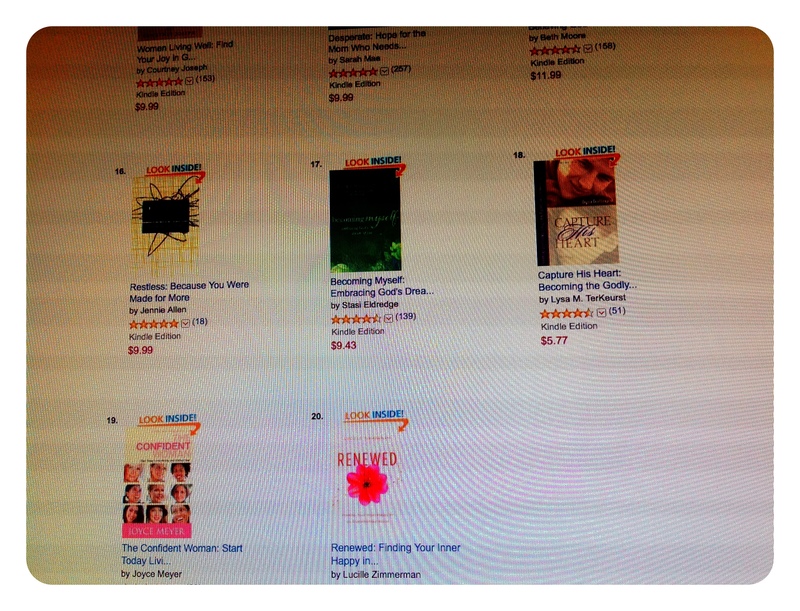 I’ve been satisfied with sales, and find #5 on your list to be the most pleasing moments of my short experience. Biggest surprise: people who say “Yes, I will read/review/post” and never do, even when copies are provided. You never know who will even let you know that they received your book, (including family members!) But then a stranger emails or leaves a comment on your blog and it’s a great day. The second biggest surprise: the difficulty taking time away from marketing to go back to work on book two. Somehow we’ll get along and move forward. Thanks for this great post. Hi Dean, congratulations on your book. There’s always that tension between marketing and writing, isn’t there? Amy, you have done a tremendous job marketing your book. Glad you’re finding time to do some selfcare in between writing and marketing. All of these things have floored me! Post-launch marketing has been such a surprise. My novel Refuge launched March 25, so I’m still muddling along in the dark, realizing I will market into the void without knowing what is working or why. It has surprised me who has generously offered their time to help me spread the word and who has not, even though I read here long ago that this would be the case. This entire process from beginning to end (whenever that is) has been a learning experience! Thank you for sharing this, so we newbies know this is how are lives are now shaped. This is the new norm. Such a difficult job! It’s a good thing the Lord and point #5 carry us through! Melinda, congratulations on your novel. Your book has received some great reviews. Thanks! It really has! Now I just have to keep plugging away with my publicist. Thanks again for the encouraging words! Jan, I’m so glad you MADE the time to go outside and read for pleasure. Two years after publication I’m thrilled to still have speaking engagements based on my book. The book’s mission is my mission and anything I can do to help it reach readers is great. Yes, #5 is the best. My favorite was when a blogger in New Zealand posted on her top 20 favorite Christian books and included mine. We ended up corresponding and I met with her small group via Skype when they wrapped up a study of the book — at 2:00 a.m. in my time zone! Ah, Gary, what a fun experience. I agree, it’s a blase when people outside of your own country get ahold of your book.